We know how it goes. As a product manager you’re busy dealing with day-to-day demands: prioritizing the backlog, updating various stakeholders, and putting out fires. Often it’s only after dealing with all of these demands that you’re able to think strategically about your product. What are the initiatives that move your product strategy forward to meet business goals, delight customers, and meet competition head on? But if this strategic thinking is last on your list, you may resort to reactively prioritizing your roadmap by focusing on the sales reps, executives and other stakeholders loudly asking for features. This “bottom-up” approach to creating your product roadmap is counterproductive and ultimately leads to a weak product. At ProductPlan we believe a top-down approach starts with the vision and strategy for your product. Why are you developing this product in the first place? What are your goals? In a sense, not starting with the vision and strategy is like building a home without first pouring the proper foundation; none of the subsequent steps in your construction process, or the quality of your other building materials, are going to matter much. That house will have problems. We’ve found through hundreds of conversations with successful product managers that a top-down strategic planning process is better. They tell us that their executives and stakeholders are more on board when discussions about future initiatives tie directly to the product vision and goals. This top-down discussion and planning has a greater chance of producing a product roadmap that moves the needle for the company. For many product managers, the product vision may have been set long ago. But the specific goals are often well within their sphere of influence. 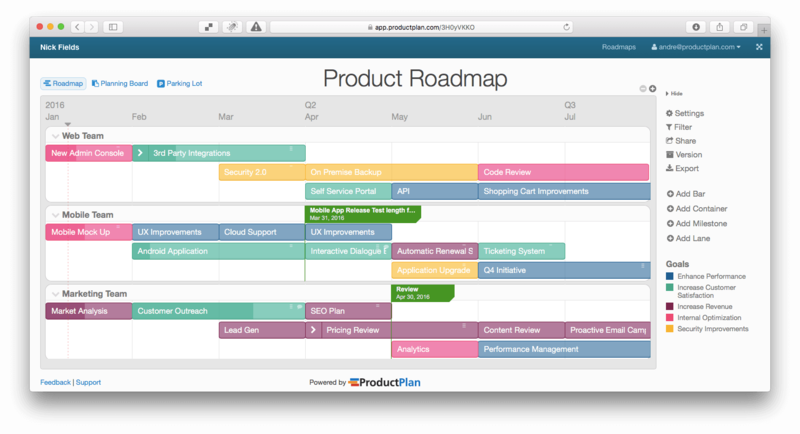 From there, you can define the product roadmap and the eventual release plan. We think of the top-down model like this diagram, with the product vision defining the goals, roadmap, and eventual release plan. Without a well-thought-out product goals in place, your product is much more likely to drift from its original objectives, to be misunderstood by your stakeholders, and to suffer from feature-creep and other risks to its integrity. Particularly if your product is new, creating a solid product strategy must happen first in the product development process — before you begin creating feature lists, drawing up user stories, and building detailed customer personas. How well are you articulating your product vision? Although it may have been handed down long ago, a clear, well-thought-out vision for your product will help you align others and develop your strategic goals. Consider the broad vision statement from Google: Nearly 20 years ago, when the world knew Google only as a search engine, the company first unveiled their vision: “To organize the world’s information and make it universally accessible and useful.” This vision has guided the company long after they branched out from search. The ultimate vision for the product is why it exists, for whom, and how it will help them. From the product vision you can derive product goals that will in turn influence the initiatives that are on your roadmap. Coming up with product goals is the step that helps you translate your product strategy into an executable plan. As you can see, these goals are general, but can usually be measured and tied back to metrics and Key Performance Indicators (KPIs). It’s these types of goals that will resonate with your stakeholders. Goals are often longer-term initiatives — for example, they might change annually rather than monthly. Of course, this product strategy exercise will not be only for your benefit or your team’s. As a product manager, you are both your product’s chief strategist and its chief communicator — and many different constituencies and stakeholders will be looking to you to explain the “why” of your product to them. Your executives need to know (and agree with) your product strategy — because they will ultimately need to sign off on that big-picture vision and the plans that flow from it. Your development teams need to know what you have planned for your product, and why, because they will be responsible for building it. Your sales, customer service, and marketing teams will need to know the what and why as well — so they can articulate your strategy to the market. It makes it easier to articulate the product vision to any constituency across your company, and ensure your stakeholders are on the same page before you begin the detailed conversations that follow. It makes it easier for you to clearly see your product’s vision, and allows you throughout the roadmap process to more clearly identify priorities as well as those items that should be set aside because they don’t serve the product vision. With a vision in place for your product, and specific goals that support that vision, you are ready to build your product roadmap. Keep in mind that the roadmap should stay high-level and strategically focused — it should not become a feature set, a list of requests or demands from various constituents, or merely a project timeline with details about resources and budgets. Keeping your product roadmap at the strategic level is the best way to ensure all of your constituents understand your high-level objectives for the product and that everyone is working toward a shared goal. It’s also the best way to secure the buy-in you will need from executives and other stakeholders to move forward with your product in the way the evidence has told you it should be developed. At this stage, you have successfully drilled down into the “details” phase of your product planning. You’ve identified your product’s reason for being (its vision), set several strategic goals for the product (backed by evidence and tied to your company’s broader objectives) and created a high-level roadmap that clearly articulates where you see the product going, and why. Now you can begin translating this strategic thinking into specific product features, functionality, milestones, release dates and other details you will use to begin building the product. We think of this as the execution of the strategy. This is why it is so important that, at the earliest stages of product development, you keep your thinking strategic and high-level. Do not allow any talk of feature details, specific customer needs, company resources or deadlines crowd out your vision-level thinking here. When it comes to ushering a product into the market, developing the right product strategy is just as important to ensuring a successful launch as pouring the right foundation is to building a home that stays standing. Thanks for the post – I agree with most of it and would like to know your opinion about vision and goals when it comes to startups. People usually come with an idea, create a lean canvas or something similar and iterate until they find the right business model, customer segment etc. It’s a process where you learn new things, everything is changing very fast and the product is just forming. And even if you are successful and release some MVP, you still might not have an idea what the product will look like in next 6 months. You might know the vision (e.g. Help people to search for information), but still might not be sure about your goals. What would you suggest? Great question Andrew. I’ve been faced with this several times, where the product is in flux up until launch. I think it’s essential that the vision be solid from the beginning, and this vision and high-level value proposition needs to resonate. In my experience, once you find product/market fit, the goals tend to present themselves. If a team hasn’t reached product/market fit, then *that* should drive the goals. That starts with defining what product/market fit means – is it conversion metrics? Revenue numbers? That will be different for every company. Then after defining what product/market fit means to you, you begin measuring. In our experience at ProductPlan, our metrics are clear – they’re the typical SaaS metrics that you may have heard about: CAC, LTV, an so on. Your industry and product will be different, but in my experience, it starts with defining success (product/market fit). Best of luck!